From The Daily Mail, once again the LEFT is allowed to do anything they want in making threats and creating a narrative of assassinating a Republican president. Actor Sean Penn’s debut novel’s main character does just that and calls the assassination of the president and dares the commander in chief to ‘Tweet me, b*tch’. UNREAL. What do you think would happen if such a book was written and the president was Barack Obama? Maybe the Secret Service need to pay Mr. Penn a visit. Actor Sean Penn’s debut novel’s main character calls for the assassination of the president and dares the commander in chief to ‘Tweet me, b****’, DailyMail.com can reveal. The two-time Oscar winner’s 176-page fiction, titled Bob Honey Who Just Do Stuff, is about a ‘modern American man, entrepreneur, and part-time assassin’. Toward the end of the novel, Honey admits himself into a hospital and writes a letter to the president of the United States, who is eerily similar to Donald Trump but goes by the name, Mr Landlord. He writes: ‘Many wonderful American people in pain and rage elected you. Many Russians did too. Your position is an asterisk accepted as literally as your alternative facts. The character says that those against Mr Landlord ‘own the most powerful weapons on earth’ which include ‘dreams, the science of physics, seismology, geology, topography, and typhoons’. Honey continues: ‘Your gasconade and cache of catchphrases, so limiting and reflexive, escalate the emasculation of you by a world whose patience is in nuclear peril. These sciences and sensibilities are our guns your narcissism neglects. ‘Weapons your NRA masters are incapable of proffering for profit, and outside your dutiful military’s might, mandate or mission. ‘So to your attempt to posthumously assassinate our Founding Fathers, and bait and switch your core, I say I will eat where the fish are glowing. ‘You are not simply a president of impeachment, you are a man in need of an intervention. We are not simply a people in need of an intervention, we are a nation in need of an assassin. I am God’s squared-away man. More hate from the LEFT. Now we have a Missouri state Senator calling for the assassination of President Donald Trump. Are you joking? The post has since been taken down. In an interview, Chappelle-Nadal acknowledged she wrote the offending line on her personal Facebook page in response to another commenter before deleting it. However, she refuses to apologize. The Secret Service needs to pay her a visit and she needs to be arrested. This is how the LEFT reacts, with threats of violence. Talk about hypocrisy! She claims that Trump is threatening and violent and she pulls this? She claims there is a bigoted president in the White House, yet it looks like there is a crazy, assasination wanting screwball in the Missouri sate house. Missouri’s top Democrats call for senator to resign for ‘I hope Trump is assassinated’ post. Even Democrats who wish this would happen, know you can’t say it or make such things public. This is how vile and sick the LEFT has become. However, the state senator says that she will not resign. We shall see. “I hope Trump is assassinated!” Missouri state Sen. Maria Chappelle-Nadal, D-University City, wrote during a morning Facebook exchange, referring to Republican President Donald Trump. Actor Johnny Depp referenced assassinating Donald Trump during an appearance at Glastonbury, England during Cineramageddon. Depp said, “When was the last time an actor assassinated a president?” REALLY? And we wonder why lunatics have attempted to assassinate Republican law makers why practicing baseball? REALLY? Maybe American law enforcement and the Secret Service need to pay Mr. Depp a visit when he returns home. This over the top crap of threats to Trump and those on the Right from the lunatic LEFT have got to end. Some one needs to be made an example of and prosecuted. This is not free speech and to hide behind the cowardice that it is a joke, is a joke. “I think he needs help and there are a lot of wonderful dark, dark places he could go,” Depp said, to cheers from the crowd. “It is just a question – I’m not insinuating anything. By the way, this is going to be in the press. It will be horrible. I like that you are all a part of it. “When was the last time an actor assassinated a president?” he asked in reference to the death of Abraham Lincoln by John Wilkes Booth in 1865. “I want to qualify, I am not an actor. I lie for a living. However, it has been a while and maybe it is time,” he added. 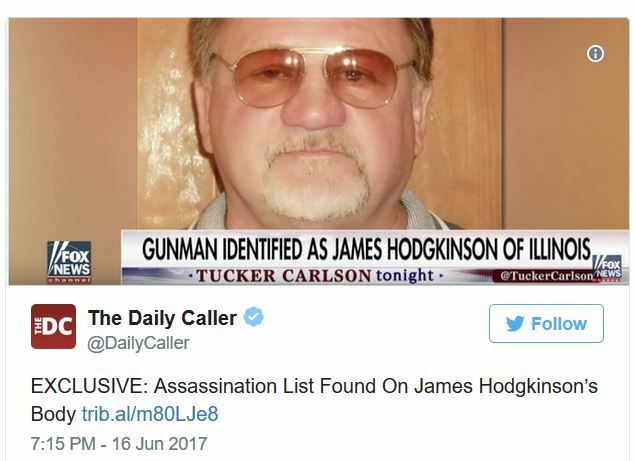 As reported at The Daily Caller, an assassination list was found on the body of James Hodgkinson, the Left-wing radical, who attempted to shoot Congressional Republicans while they practices baseball this past week in Alexandria, Va. As suspected by the fact that Hodgkinson’s asked whether those practicing were Republicans or Democrats, this was not a random act of violence. The assassination, kill list proves proof positive that this was a premeditated attempt to murder Republicans. Names on the hand written list included, Alabama Rep. Mo Brooks, South Carolina Rep. Jeff Duncan and Arizona Rep. Trent Franks, Ohio Rep. Jim Jordan, Tennessee Rep. Scott DesJarlais and Virginia Rep. Morgan Griffith. All conservative members of the House Freedom Caucus. This was a premeditated effort by a whack-job on the LEFT to assassinate Conservatives. Imagine what the wall-to-wall news cycle would have been like had Hodgkinson been a Conservative with an assassination list, or a member of the Tea Party? But instead, he was a LEFTY who volunteered for Sanders’ campaign so Democrats and the MSM cry, for the moment, or the second, can’t we all just get along. 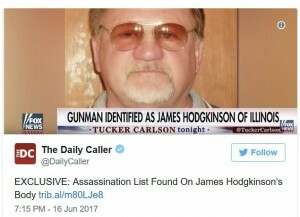 James T. Hodgkinson, the shooter who opened fire on dozens of Republican congressmen and staffers at a baseball practice in Alexandria, Virginia, on Wednesday, had a list of Republican names in his pocket that was recovered by the FBI, The Daily Caller has learned. The news that the shooter had a list of names suggests the shooting was not a random outburst, but instead appears to be a premeditated political assassination. Isn’t it ironic and typical that for years we have been told by the MSM, Democrats and the LEFT that it was the Tea Party that was violent and that they would harm liberals and even make an attempt on former President Obama’s life. But instead, it is the LEFT that attempts assassination. Virginia Gov. Terry McAuliffe said following the shooting in Alexandria, VA yesterday that 93 million Americans were killed every day by guns. Huh? McAuliffe, the so-called Democrat darling to run for president in 2020 repeated it, 93 million. Imagine that, there are on 321.5 million people live in the United States. In other words, according to this brain surgeon who was so quick to bring up gun control following the shooting, without knowing any of the facts, it would take 3.5 days to kill everyone in the U.S. by gun violence. Care to amend your data Gov.McAuliffe? He would later correct himself when questioned by a reporter and say 93 individuals. Missed it by that much, McAuliffe says this is not what this day is about, yet he made it exactly about gun control. Interestingly enough, it was the two Capital police individuals that there there as a protective detail that saved all of these Congressmen and prevented this massacre. “Sir, just checking. Ninety-three million is a big number. Did you mean to say 93 million?” one reporter then asked. “Ninety-three individuals a day,” McAuliffe corrected himself.